The ongoing blackout of the Weather Channel in DirecTV homes -- affecting fully a sixth of all American households -- exposes a challenge for television channels that carry weather, news and other types of information that are increasingly accessible on the Internet. The channels have to ensure that they're providing something the Internet can't -- and that may be getting harder and harder to do. "News, weather and financial information are so widely available online, it's very cannibalistic to these genres," said Derek Baine, a senior analyst for SNL Kagan. The television blackout, after all, doesn't extend to what is arguably the Weather Channel's most important asset, Weather.com. DirecTV customers still have access to the Web site, "which may be cannibalizing the core channel anyways," Baine said. Weather Channel representatives push back by saying that they've invested heavily in new talent (like the former "Good Morning America" weather anchor Sam Champion) and technology for television programs. For several days leading up to the Monday night contract deadline, the channel asserted that a blackout would be detrimental to the safety of DirecTV (DTV) customers because it would leave them without the channel's severe weather coverage. DirecTV was apparently unpersuaded, because it dropped the channel at midnight and put a small competitor, WeatherNation, in its place. "The Weather Channel does not have an exclusive on weather coverage -- the weather belongs to everyone," DirecTV chief content officer Dan York said in a statement. These feuds are usually about the cost of channels. In this case, the Weather Channel is asking for a slight increase; DirecTV is trying to force the channel to accept a decrease. York indicated that DirecTV would try to restore the channel at "the right value;" in the meantime, now that it's been removed, the Weather Channel is trying to convince DirecTV subscribers to switch to another television service. David Clark, the channel's president, wrote on Twitter on Tuesday that "there are NO discussions happening" with DirecTV and that the channel "is off permanently." One of the dynamics in this dispute is the availability of weather information. The Weather Channel's parent company, called the Weather Company, has been a leader on the web, with a hugely popular site and forecast app. "Is it going to rain today?" is a question often better answered by a smart phone app, which is always on, than a newscast, which may be in a commercial break when a viewer is deciding whether to carry an umbrella out the door. The Weather Channel knows this, of course, so it has tried scheduling some reality TV shows during quiet weather periods, and it has emphasized field reporters who are out in the elements during busy periods. Other cable channels that face fresh competition from the Internet -- including CNN -- have also tried to add unique programming in recent years so that they're not known only for commoditized news or information. Fox News Channel and MSNBC have emphasized point-of-view programming. CNN has featured documentary series like "Anthony Bourdain: Parts Unknown." Barry Parr, a media analyst for Outsell, said he was wary of generalizations about the commodity nature of news coverage. "Breaking news is a commodity, but if your TV news coverage is a commodity, you're doing it wrong," Parr said. "Weather information, however, couldn't be more of a commodity." He suggested that DirecTV's decision to drop the Weather Channel "could be a signal to future negotiating partners. We're entering a world where pay TV fees are a zero-sum game. Pay TV operators are not going to be able to increase much, if at all. So, the Weather Channel may be a cheap way to signal a desire to draw the line." 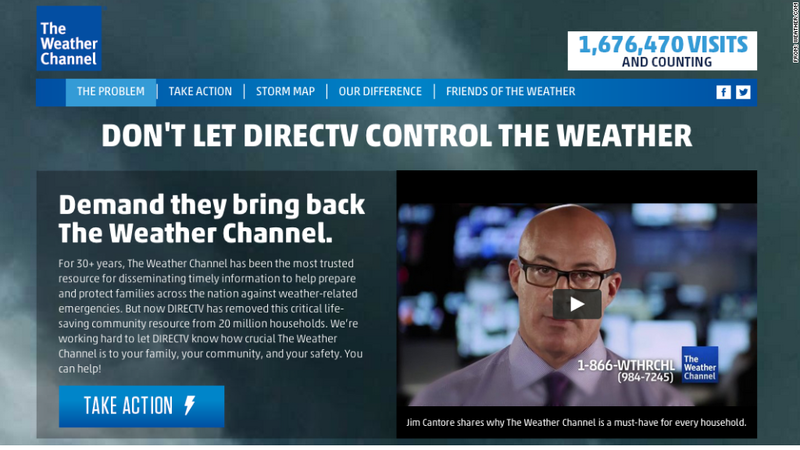 The Weather Channel, for its part, sharply criticized DirecTV's decision to put the upstart WeatherNation channel in its place, calling it "a cheap startup that does weather forecasting on a three-hour taped loop, has no field coverage, no weather experts ... and no experience in severe weather emergencies." David Kenny, the head of the Weather Channel, added in a statement that "I am hopeful DirecTV will come to their senses soon and will not force its customers to change carriers to stay safe and informed."